This is one of the pieces in the Verdant Works Exhibition ‘The Arctic Whaling Year’, Autumn 2018. As whaling decreased the populations of whales, the whalers hunted other marine mammals to maintain their profitability. Seal skins were a valuable commodity and to maximise the economic return, whaling ships could leave earlier from British ports, pick up men from places like St Johns in Newfoundland and head to the nearby sea ice where huge numbers of seals were born each year. The skin of the young seals was particularly sought after. The seals were killed and roughly skinned. The skins were collected together prior to being dragged back by the men to the ship, which was moored to the edge of the ice, often some distance away. The skins would be dropped off at agents in Newfoundland or brought back to the home port before starting the whaling voyage proper. 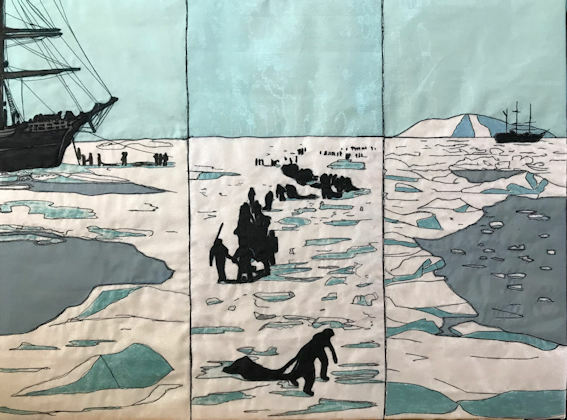 Textile panel (80 x 60 cm) from ‘The Arctic Whaling Year’ exhibition at Verdant Works, Dundee, Autumn 2018, Fabric marker pens and freehand machine embroidered layered sheer fabrics on unbleached cotton. It was the innovation of using auxiliary steam power which made this possible. Ships could approach the edge of the ice more reliably using steam power rather than having to rely on the sails. The arrival of these first steam-powered whalers from Dundee in St Johns, Newfoundland triggered the development of the auxiliary steam-powered sealing fleet from Newfoundland. The McManus, Dundee’s Art Gallery and Museum holds a fantastic collection of early photographs of the Dundee whaling trade. I have used three of these as the basis for this triptych.